Set yourself up for a successful stay at the recently refreshed TownePlace Suites San Antonio Airport. 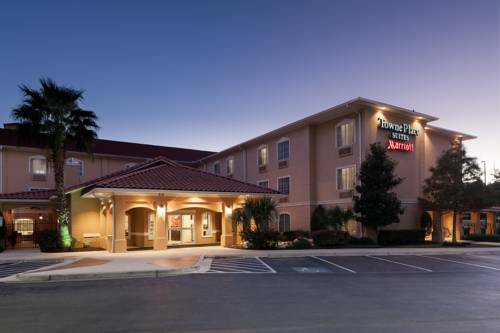 Ideal for extended stays near San Antonio International Airport (SAT), we offer a 24-hour, complimentary shuttle service as well as easy access to Randolph AFB, Lackland AFB, Fort Sam Houston, St. Mary's University and UTSA. When it's time to unwind, make yourself at home in our hotel's updated suites featuring fully equipped kitchens, living areas, free Wi-Fi, large workspaces, modernly appointed bathrooms and luxurious bedding. After a restful night, start your day off satisfied at our complimentary hot breakfast buffet, serving up warm waffles, fresh fruit, cold cereal and other morning favorites. Stay active and entertained during downtime at our San Antonio hotel near the airport with our on-site fitness center, or soak up the sun in style at our sparkling outdoor pool. Whether traveling on business or leisure, TownePlace Suites San Antonio Airport has everything you need to feel right at home.